The Basics of Bead Stringing, a long time best selling book on the art of creating professional-looking jewelry, has just undergone a complete revision. 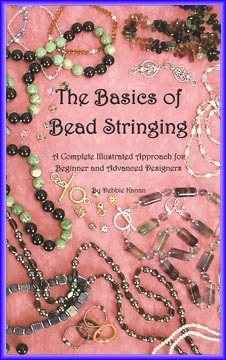 The new edition includes the latest tips and materials affecting the bead stringing craft. Traditional and contemporary techniques on multi-strand projects, knotted strands and wire wrapping are just a few of the highlighted features. Easy to understand instructions and complementary illustrations assure bead stringing success with the very first project. Learn how to select tools, beads and bead stringing materials. Master the basic techniques to create masterpieces. This book is suited for the beginner and professional jewelry crafter. Makes a great gift!